I.C Date letter "a" 1736 Unrecorded? Goblet form, design may have been added circa 1850? 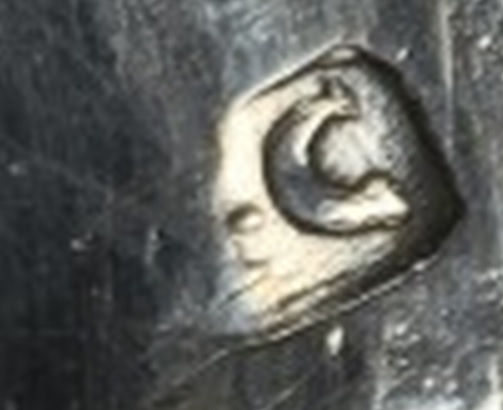 IC with a dot inbetween, makers mark slightly obscured, I believe the letter "a" is 1736 and not 1776 because this "a" looks skinnier. Re: I.C Date letter "a" 1736 Unrecorded? Now I think it looks like a "W . C" Does anyone think it looks like that? Was there a WIlliam Chawner the First hallmark, Just William Chawner? Looks like 1776 to me based on the outlines of the punches. My eyesight offers no help with the maker's first initial, but if it is a W.C mark I confess that I give up when it comes to identifying which of the many WCs around this date. Maybe somebody else is able to be more confident. Re: I.C Date letter "a" 1776 Unrecorded? Right, I am thinking 1776. At least the pellet is clearly visible in the center, and the "C" is very distinct, but even so, it looks like we have reached the limit of perception here. The base of the first letter with the serif, does not appear to be a 'W' to me, more upright like 'H', 'I', 'M', 'N' or 'Y', but I find no stand out candidate.